For my scripting tool the idea I wanted to make was an assisting tool to making control shapes. For the character rigs in my Professional Project the control shapes are mostly for FK rotation rather than the IK solvers used in my rig for this module. I’ve found that the easiest rotation control shape looks like the rotate tool itself which is made up of 3 circles. To make this manually is on the complicated side and even requires the use of a command. How this control shape is made is by creating a NURBS circle, duplicating it twice and rotating them into position. You then freeze transformations on these circles and delete their history. To combine them you combine their shape nodes under the main circle’s transform node. Then, it is like any other control shape that requires grouping and positioning. I would also like to include other options such as locking translation controls, automatically Orient Constraining the joint to the shape and colouring the control shape. 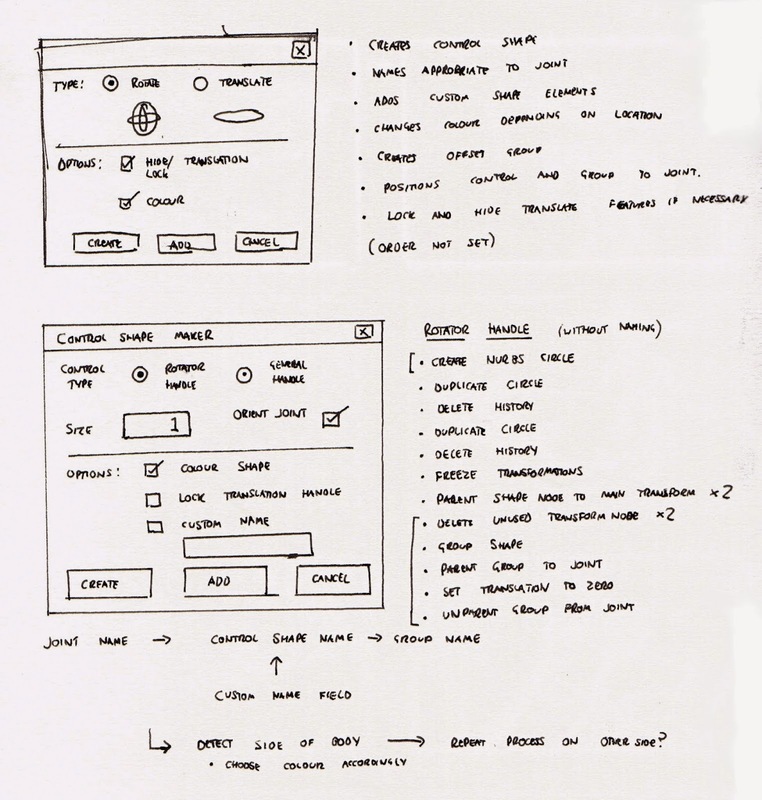 This is a sketch of an interface I’d like to aim for, it also includes some notes on the functionality of the script.